The fairy tale called Marvel games has just ended. On April 1 the world’s top software developer Playtech removed all Marvel slots from their casinos online. Everyone all around thinks it’s a terrible loss. The first Marvel slots, Iron Man and Incredible Hulk, appeared at online Playtech casinos in 2009. They became an instant hit and the company launched 13 more. Here are the games that made casino players excited and thrilled for nine years: Avengers, Blade, Daredevil, Elektra, Fantastic Four, Ghost Rider, Iron Man, Incredible Hulk, Punisher War Zone Captain America, Wolverin, Thor – the Mighly Avenger, and X-men. Where to play Marval Slots Now? “Why did this happen?” you can ask. How can the gaming content provider withdraw the games which are extremely popular? Let’s go back to history to get to know the reason to this troublesome event. Why Did They Remove These Slots? In March 2009 Playtech signed the licensing agreement with Marvel Entertainment Inc. to use Marvel comics to create slots games. That time Mor Weizer, Chief Executive Officer of Playtech, commented that deal: “This agreement is a major stepping stone for Playtech, as it will greatly extend the commercial appeal and cross-selling opportunities of our products. Branded slots are a good way of diversifying our product and attracting new players.” He proved to be right; Marvel slots became very popular and attracted more and more new players. However, few months later, in August 2009, the Walt Disney Company acquired Marvel Entertainment. It was a turning point in the Marvel slots history. Disney has created their family-friended image and tries their best to keep it. They say: “…our guiding philosophy has been to act as a compassionate and generous company that leverages our resources to bring happiness, hope, and laughter to the lives of children and families in need and promote a culture of giving. Disney also uses our media platforms to inspire others to make a difference.” So they don’t want to have something in common with the gambling industry. Thus, in 2011, Florida wanted to expand the number of gambling operations in the state. Disney was vehemently critical of the building of casinos anywhere near its world-known theme park, Disney World. In 2014 Disney announced that they would terminate their agreement deal with another gaming software providing company, Cryptologic. What Is Playtech Going To Do? As we know nature abhors a vacuum and Playtech is to fill this gap. In February, 2017 the company signed3 an agreement with Warner Bros. to develop a series of Omni-channel DC-branded slot, bingo and roulette games, available across multiple channels and devices. These games will be linked to the DC Super Heroes Progressive Jackpot. Moreover, Playtech is going to reuse some of the game engines connected with the Marvel slots. They plan to re-brand the games to the Age of the Gods slots series. Thus, Prince of Olympus is built upon The Incredible Hulk, King of Olympus uses Iron Man 2, Furious 4 has something to do with The Fantastic Four and Age of the Gods is based on the Avengers. We are sorry Marvel slots disappeared from Playtech casinos, but hope we’ll soon see and play some more interesting and exciting new games. So, what is the difference between Marvel slots and usual casino slots? First of all, you will see your favourite characters as symbols on the reels. The plot of every slot is built around the adventures of famous characters widely known to many comics fans. The developers do their best to make these machines unforgettable. Marvel casino slots have state-of-the-art graphics, true-to-life sound effects and perfect animation. During bonus games the characters become alive and you can see them moving, shooting, fighting, flying, etc. So, you watch a real action movie. Today one more company has a license to produce Marvel slot machines. This is one of the leading software developers, PlayTech. Marvel multi-level mystery progressive slots are one of the recent additions to the family of PlayTech machines. Besides colourful bonus games, another evident advantage of Marvel slots is the progressive jackpot. In fact, these slots have 4 linked Progressive jackpots which can be won during the randomly triggered bonus game. The Bonus Game is played on a 4×5 grid which has 20 squares. There are different jackpot icons under each square. To win any of the jackpots the player has to find 3 identical jackpot symbols. However, there is time limit and if the player is late the jackpot will be paid automatically. The progressive jackpots are Power, Extra Power, Super Power, and Ultimate Power Progressive Jackpots. The Power Jackpot is won every hour and reaches $374 on average. An average Extra Power jackpot is $4,200 and hit every 4 hours. A Super Power is $40,500 won every 2 days and an average Ultimate Power Progressive Jackpot reaches $910,000 and is hit twice a year. The biggest Marvel progressive ever won at PlayTech casinos was $1,365,716. At the point PlayTech online casinos offer nine Marvel slots – Blade, Daredevil, Elektra, Fantastic Four, the Incredible Hulk, Iron Man, Iron Man 2, Punisher War Zone, X-Men. Offer random Marvel Progressive Jackpots as well. There are 3 Marvel Jackpots – Marvel Hero Jackpot, Super Hero Jackpot and Hero Jackpot. You don’t need to hit any special combination to win any of these progressives. The size of the wager determines the chance of winning a jackpot. A jackpot can be triggered randomly at the conclusion of any spin. Marvel Hero Jackpot starts at $5,000; Super Hero Jackpot – at $500 and Hero Jackpot starts at $50. 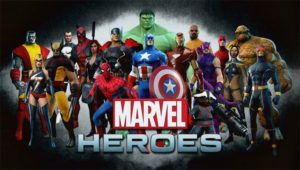 Marvel slots available at Cryptologic online casinos are Blade, Daredevil, Captain America, Elektra, Fantastic Four, Ghost Rider, Iron Man, Spider-Man, Spider-Man Revelations, Wolverine, the Incredible Hulk, Hulk-Ultimate Revenge, Silver Surfer, Sub-Mariner, The Punisher, Thor and X-Men. Marvel comics slots machine first appeared at casinos online more than ten years ago. With the top-notch graphics, true-to-life sound effects and fantastic animation these slots attract more and more people. Everyone likes to watch their favourite characters spinning on the reels and coming to life during bonus games. The plot of each slot is based on adventures of famous characters known to many comics fans. Cryptologic was the first of online gaming software suppliers that received the exclusive rights to make slot machines based on Marvel comics in 2005. The Marvel slots you can play at Cryptologic online casinos are Blade, Elektra, Captain America, Fantastic Four, Daredevil, Ghost Rider, Hulk-Ultimate Revenge, Iron Man, Silver Surfer, Spider-Man, Sub-Mariner, Spider-Man Revelations, Wolverine, the Incredible Hulk, Thor, The Punisher, and X-men. Today more companies have license to produce Marvel games. One of them is the top software provider, Playtech. PlayTech online casinos offer a good number of Marvel slots. They are Blade, Fantastic Four, Captain America, Ghost Rider, Daredevil, Iron Man slot, Iron Man 2, Iron Man 3, ELektra, Punisher War Zone, the Incredible Hulk, the Avengers machine, Wolverin, Thor – the Mighly Avenger, and X-men. Playtech Marvel jackpot consists of four jackpots: Power, Extra Power Jackpot, Super Power Jackpot, and Ultimate Power one. The Power Jackpot is won almost every hour and is $374 on average. An average Extra Power jackpot is $2,600 and hits every 2 hours. A Super Power is $35,200 won once a day and an average Ultimate Power Jackpot can reach $711,000 and is hit every two months. There are 3 tiered jackpots in Cryptologic Marvel jackpot which is triggered randomly. It means there is no special combination to win any of these progressives. The size of your bet determines the chance of winning a jackpot. Marvel Hero Jackpot begins at $5000; Super Hero– at $500 and Hero one begins at $50.